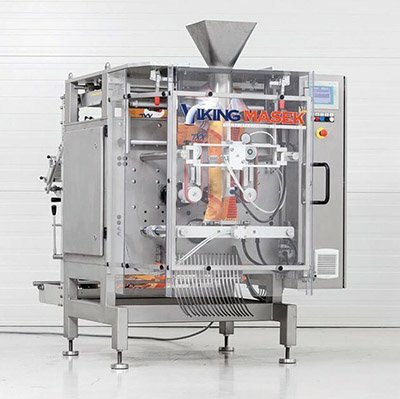 Vertical form fill seal (VFFS) packaging machines are used in almost every industry today, for good reason: They are fast, economical packaging solutions that conserve valuable plant floor space. 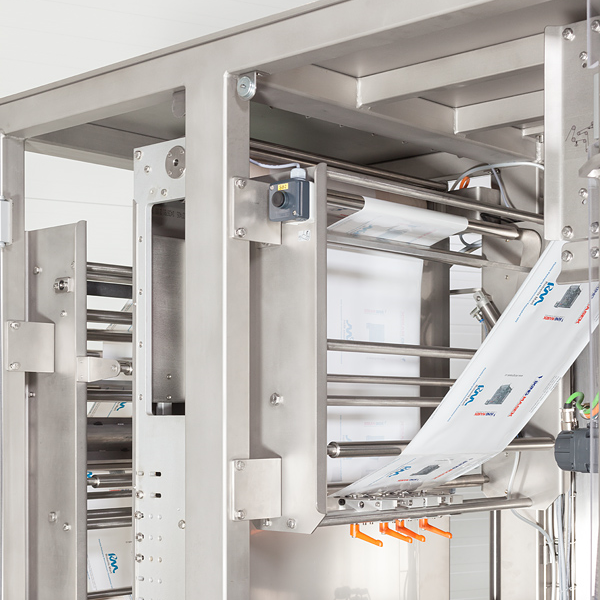 Whether you're new to packaging automation or already have multiple systems, chances are you're curious as to how they work. 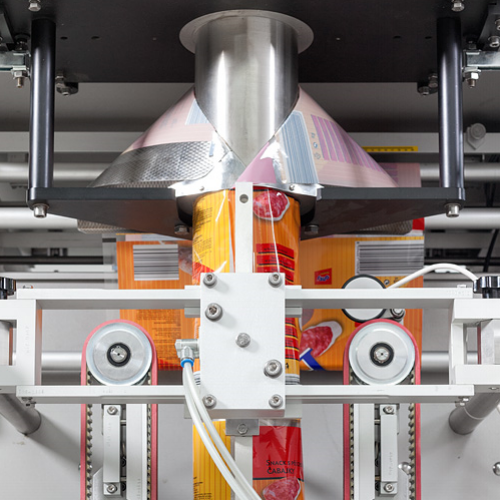 In this article, we are walking through how a vertical form fill seal machine turns a roll of packaging film into a shelf-ready finished bag. Vertical packaging machines use a single sheet of film material rolled around a core, usually referred to as rollstock. The continuous length of packaging material is referred to as the film web. This material can vary from polyethylene, cellophane laminates, foil laminates and paper laminates. The roll of film is placed on a spindle assembly at the rear of the machine. 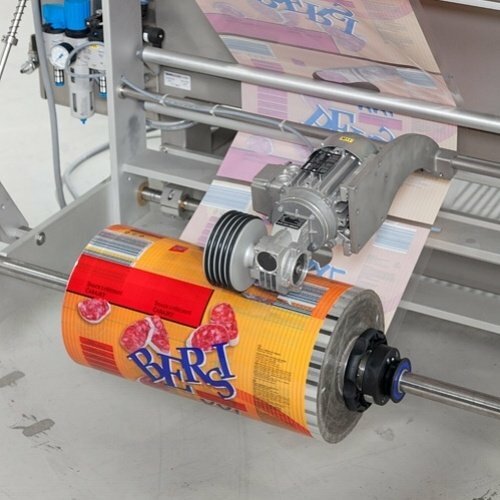 When the VFFS machine is operating, the film is usually pulled off the roll by film transport belts, which are positioned to the side of the forming tube which is located at the front of the machine. This method of transport is the most widely used. On some models, the sealing jaws themselves grip the film and draw it downward, transporting it through the machine without the use of belts. An optional motor-driven surface unwind wheel (power unwind) may be installed to drive the film roll as an assist to the driving of the two film transport belts. This option improves the unwinding process, especially when the film rolls are heavy. During unwinding, the film is unwound from the roll and passes over a dancer arm which is a weighted pivot arm located at the rear of the VFFS machine. The arm incorporates a series of rollers. As the film transports, the arm moves up and down to keep the film under tension. This ensures that the film will not wander from side to side as it is moving. After the dancer, the film then travels through the printing unit, if one is installed. Printers may be thermal or ink-jet type. The printer places desired dates/codes on the film, or may be used to place registration marks, graphics, or logos on the film. Once the film has passed under the printer, it travels past the registration photo-eye. The registration photo eye detects the registration mark on printed film and in turn, controls the pull-down belts in contact with the film at the forming tube. The registration photo eye keeps the film positioned correctly so the film will be cut in the appropriate spot. Next, the film travels past the film tracking sensors. The complete transport carriage assembly is shifted side to side to guide the web. Sensors detect the edge of the film. If the edge of the film shifts out of position, a signal is generated to move the actuator and cause the carriage to shift to one side or the other as needed to bring the edge of the film back to the correct position. From here, the film enters a forming tube. As it crests the shoulder (collar) on the forming tube, it is folded around the tube so that the end result is a tube of film with the two outer edges of the film overlapping each other. The forming tube can be set up to make a lap seal or fin seal. A lap seal overlaps the two outer edges of the film to create a flat seal, while a fin seal marries the insides of the two outer edge of film to create a seal that sticks out, like a fin. A lap seal is generally considered more aesthetically pleasing and uses less material than a fin seal. The film is drawn down by two gear motors which drive the friction pull-down belts located on either side of the forming tube. Pull down belts that utilize vacuum suction to grip the packaging film can be substituted for friction belts if desired. Once the film stops moving (on intermittent models), the vertical sealer bar, which is hot, moves forward and makes contact with the vertical overlap on the film, bonding the layers of film together. The vertical seal bar presses itself against the forming tube and makes the vertical seam. On continuous motion VFFS models, the vertical sealing mechanism remains in contact with the film continuously so the film does not need to stop to receive its vertical seam. Next, a set of heated horizontal sealing jaws come together to make the top seal of one bag and the bottom seal of the next bag. For intermittent VFFS machines, the film comes to a stop to receive its horizontal seal from jaws that move in an open-close motion. For continuous motion machines, the jaws themselves move in up-down and open-close motions to seal the film as it is moving. Some continuous motion machines even have two sets of sealing jaws for added speed. An option for a 'cold sealing' system is ultrasonics, often used in industries with heat-sensitive or messy products. Ultrasonic sealing uses vibrations to induce friction at a molecular level that generates heat only in the area between film layers. 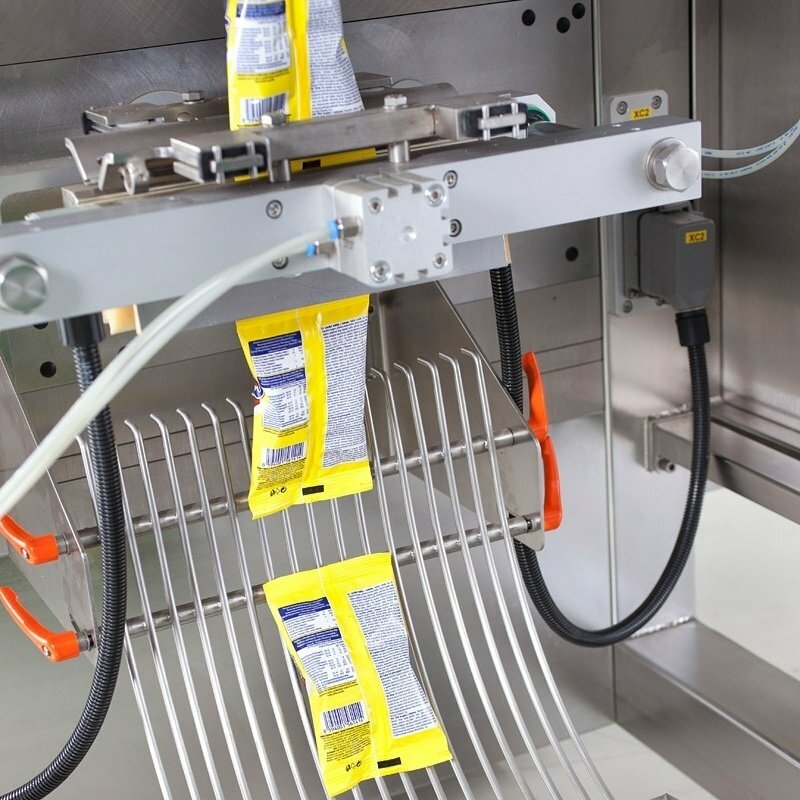 While the sealing jaws are closed, the product that is being packaged is dropped down the middle of the hollow forming tube and filled into the bag. A filling apparatus like a multi-head scale or auger filler is responsible for the correct measurement and release of discrete quantities of product to be dropped into each bag. These fillers are not a standard part of a VFFS machine and must be purchased in addition to the machine itself. 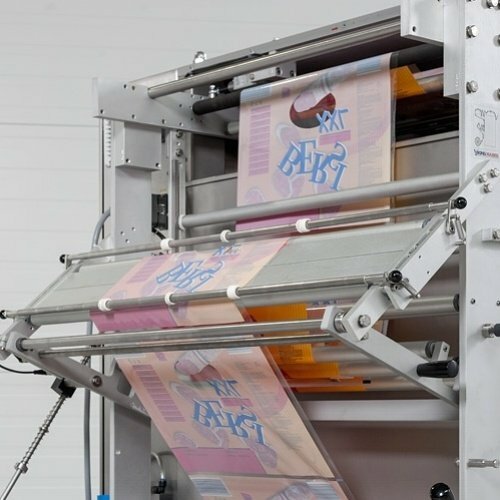 Most businesses integrate a filler with their packaging machine. 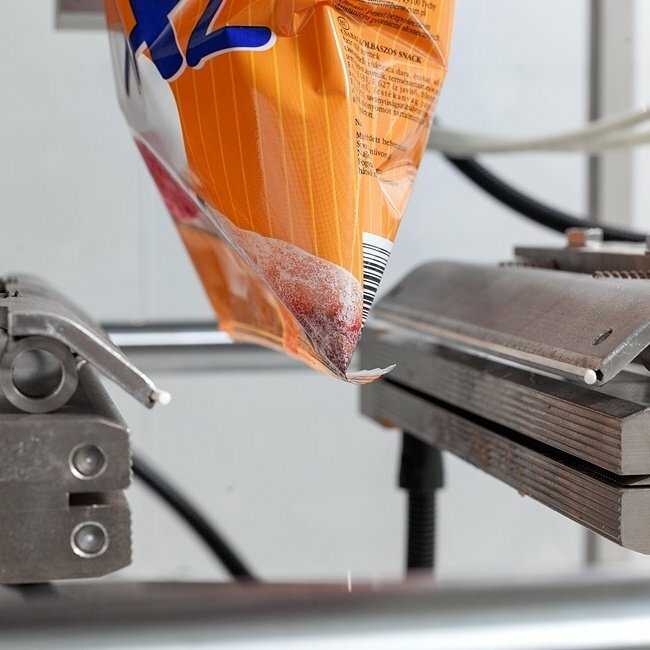 After the product has been released into the bag, a sharp knife within the heat seal jaws moves forward and cuts the bag. The jaw opens and the packaged bag drops. This is the end of one cycle on a vertical packaging machine. Depending upon the machine and bag type, VFFS equipment can complete between 30 and 300 of these cycles per minute. The finished bag can be discharged into a receptacle or onto a conveyor and transported to downline equipment like check weighers, x-ray machines, case packing, or carton packing equipment. Considering a VFFS machine purchase? Shopping for a new vertical form fill seal packaging machine doesn't have to be stressful. Download our free guide for 5 questions to ask your OEM. Did you learn something new from this article? Share the knowledge on Twitter!